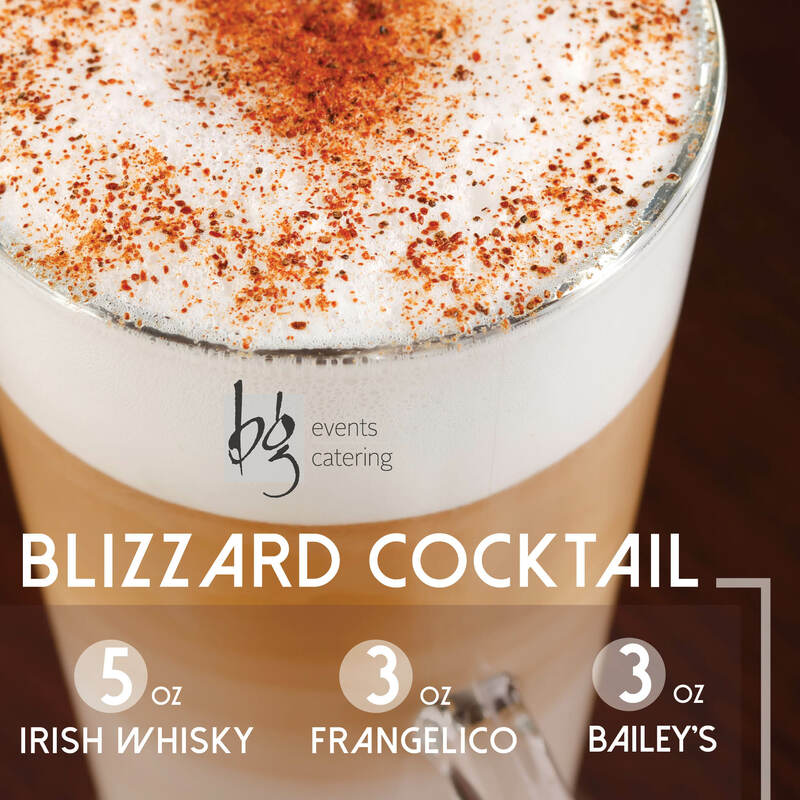 This time of year means cold Boston weather, and cold Boston weather means we need warm cocktails and beverages to keep us nice and toasty. Since we love mixing traditional cocktails and coming up with crazy concoctions, we’re going to take advantage of this cold weather and share with you a collection of winter cocktail recipes along with snack and dessert pairing suggestions for those winter beverages. Each of the hot winter cocktails listed below makes a variety of servings depending on the ingredients. Each is perfect to serve at winter parties, to enjoy during romantic nights in or to have by the fire after a long day of skiing and outdoor activities. Mix 5 oz Irish Whisky, 3 oz Frangelico and 3 oz Bailey’s. Add 3 cups of hot coffee—toasted hazelnut flavored coffee blends well with this recipe. Top with whipped cream and garnish with whole coffee beans. Snacks for blizzard cocktail: Biscuits or crackers with a variety of jams. Desserts for blizzard cocktail: Bailey’s Brownies. Baking tip: in lieu of milk in a standard brownie recipe, add ¼ cup Bailey’s Irish Cream. Mix and bake as directed. Boil 8 oz of water, and once boiling, remove from heat and add a few zests of lemon peel and 1½ tbsp Demerara (raw brown) sugar. Stir until the sugar has dissolved. Add 6 oz single malt Scotch. Stir and pour into individual glasses. Top individual glasses with an additional splash of boiling water to keep the temperature of the drink hot when serving. Snacks for hot toddy: Something smoked, like smoked oysters or smoked sausage. Desserts for hot toddy: Crème Brule. Even though Scotch is typically consumed by itself, no one will mind indulging in this delicious dessert while drinking a glass. In a large pot, heat one bottle of port wine on low heat for about 15 minutes. Add ¾ cup bourbon and ¾ cup light rum for about 10 minutes. Do not boil. While the mixture is heating, put 1 whole cardamom pod, 1 small cinnamon stick, a little orange zest and 2 whole cloves in the center of a cheese cloth, gathering the ends of the cloth and tying the four ingredients inside the makeshift sack with a string or fastener to secure it. Once the mixture has reach a high temperature, light it on fire with a long match stick, and—with the proper heatproof protection, pour ¼ cup sugar into the flames. Let the fire burn for 30 seconds before placing the pot lid over the flames to extinguish the fire. Turn off the stove, remove the pan from heat and let it cool for 30 minutes to an hour. Strain the glogg before rebottling it for storage (glogg should age for a least two weeks and up to one year before consuming). Heat for about five minutes on stovetop before serving. Garnish with dried cranberries or raisins. Snacks for glogg: Rum-soaked raisins and cranberries. Desserts for glogg: Gingersnap cookies. This is a typical winter or holiday combination in Sweden. In a large pot, combine one bottle cabernet sauvignon, one sliced (and peeled) orange, orange zests from peel, ¼ cup brandy, 8 cloves, ½ cup honey, 4 cinnamon sticks and 1 tsp ginger. Cook the concoction on low heat for about 20 minutes, but do not bring to a boil. Stir occasionally. Ladle into individual cups, remembering to pour it through a strainer to avoid sediments. Snacks for mulled wine: Cheese and cracker tray. Desserts for mulled wine: Cheesecake. For an even better combination, try a mulled wine cheesecake recipe including a glogg and sugar reduction topping that is drizzled over the top of the traditional cheesecake. Place four thin slices of butter, 1 tbsp brown sugar, 1 tsp ground cinnamon, 1 tsp nutmeg and a splash of vanilla extract at the bottom of a pan. Keep over heat until the butter is softened and the ingredients mixed. Remove from heat and add 8 oz of dark rum and hot water. Stir well and serve in individual mugs. Snacks for hot buttered rum: Fish cakes, fried calamari, roasted shrimp or other finger seafood. Desserts for hot buttered rum: Dessert bread with pecans and brown sugar crust. Add 6 oz Irish Whisky and 1 tbsp brown sugar to a full pot of fresh coffee. Stir and pour into individual mugs. Top with whipped cream and garnish with whole coffee beans. Snacks for Irish coffee: Irish soda bread. Desserts for Irish coffee: Irish cake pops. Baking tip: substitute a little bit of whiskey and a little Guinness for the liquids in a chocolate cake recipe. There are plenty more pairings to help warm your winter season. Just visit our Winter Beverages Pinterest board to check them out! If you liked these pairings, check out our Wine and Cheese Pairing Ideas for the Fall or these hot Tapas and Sangria Pairings. We also have plenty of winter holiday-related articles that are sure to help you plan your holiday parties, such as this year’s 7 Corporate Holiday Party Trends and this Holiday Party Case Study, full of wonderful photos for inspiration.